To the best of my knowledge, I don’t think that I have ever photographed swans well before – and indeed most images that I do see on Google or elsewhere, struggle to beat the threshold of what is banal. Swans are not uncommon and we all have access to the Serpentine in London or village ponds across the country. I can’t conceive how a picture taken in such a setting that would be evocative or eye grabbing. Swans have become an inadvertent accomplice to lazy postcard photography. This is all very harsh on the swan – it is such a majestic bird – with attitude , dignity and above all grace. Tchaikovsky opened our eyes to this 140 years ago and subsequent generations of celebrated stage choreographers have reinforced our adoration for the swan .The ballet probably forged the notion that swans are at home dancing in the snow and ice – a far more aesthetically pleasing concept than imaging them scrapping around in a muddy park in Berkshire. Russia gave the world Swan Lake and have earned the right to dictate climatic associations . Just as Dr Zhivago could never have been filmed in the summer, swans are surely best photographed in the bitter winter. It is the winter that personifies Russia and Northern Asia, not the summer. 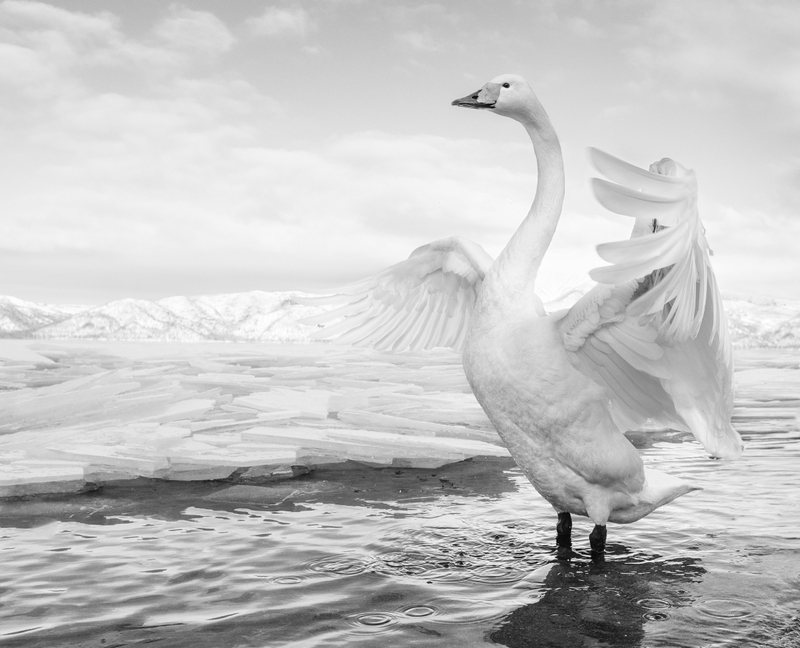 The romanticist within me had a preconception of where I could take a strong swan image and today the twin forces of research and luck came together shortly before 8.30am on the frozen ice of Lake Kussharo in Northern Hokkaido, Japan. My central premise was that there should be as much white in the picture as possible – white from the snow, white from the ice and of course white from the whooper swan’s pristine plume of feathers. The greater the cocktail of whites, the greater the possibility of an image that could be ethereal as well as evocative. My approach was to create a dream, not necessarily report on reality. In one small section of shore on Lake Kussharo, hot springs melt away the ice at the lakeside and the swans come here in large numbers over the winter. I wanted as much contextually in the image and therefore used an extreme wide angle lens. This meant getting fairly wet – but the water was warm for me too. I have looked at the image a great deal today and my eye keeps returning to the neck – just like a ballerina, this neck is all important.